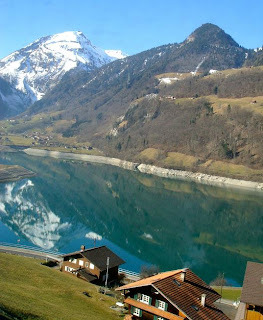 It was my fourth day in Switzerland and time to say auf Wiedersehen to Interlaken. 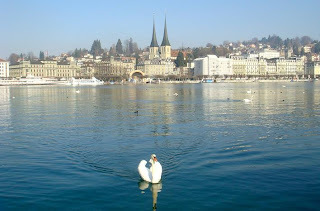 My next destination was Zürich, the largest city in Switzerland. To get to Zürich, there are two options: Going through Bern, or going through Lucerne (or, auf Deutsch, Luzern). Since I had already taken the route going through Bern, it was an easy choice that I would now stop in Lucerne. The train left soon, taking us along the shores of Lake Brienz and through forested mountains. 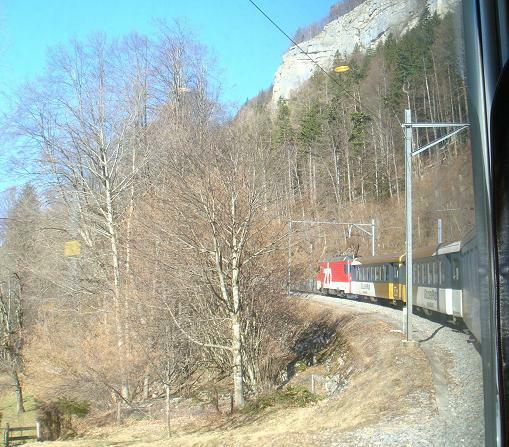 The train took me past some of the most spectacular scenery I had seen in Europe. Mountains and lakes galore. The forests were mostly bare and brown in the February sun, but the scenery was nevertheless pristine. Within two hours my train arrived in Lucerne. Just like my visit to Bern, I only had a short time to explore the city before my next train was to depart - about an hour and a half. So I dove straight into the sights of Lucerne and power walked out of the train and into the city. Lucerne is as pretty as a fairy tale, with the lake on one side and hills and mountains surrounding in every direction. Next to the train station was an art museum, but there was no time to spend gawking at art! 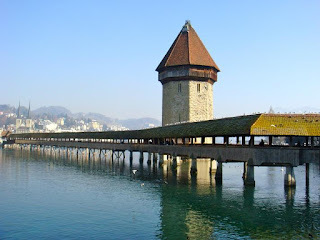 So I walked across the street and towards the Kapellbrücke, Lucerne's most distinguishable landmark. It's a bridge across the river in the center of town. The bridge was built in 1333 (!!!) and was severely damaged in a fire 15 years ago. Many of the historic paintings on the bridge's cross beams were lost. 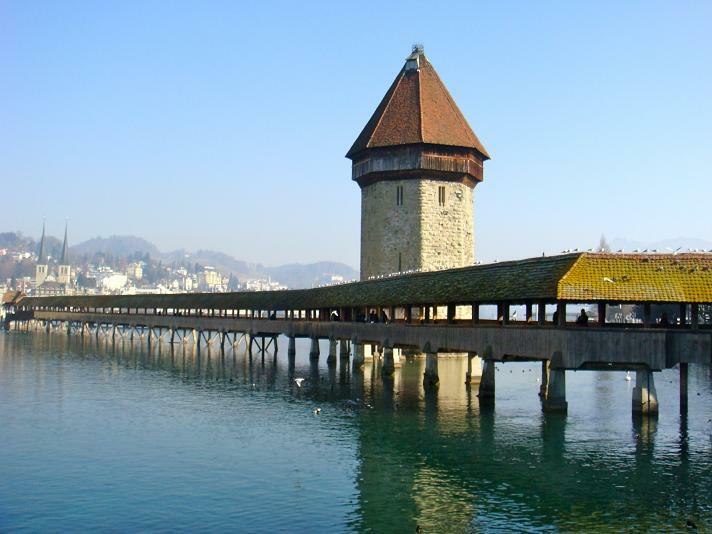 It's the iconic postcard picture of Lucerne and impressive in its simplicity. Across the bridge, I entered the city center. Like most cities, it's a pedestrian-only zone, with colorfully historic buildings rising above ground-level cafes and shops. I stopped at a Coop and bought myself a sandwich for lunch. I then wandered the narrow streets of the city. I headed uphill and ended up at the city wall, which demarcated Lucerne in medieval times. I walked through one of the towers along the wall and strolled through a hilltop park. It was sunny and extremely nice this February day. Time was running short, so I scurried downhill back trough the city, snapping photos with my camera, but also making sure to take mental photos of another gorgeous day in Switzerland. I arrived back at the train station with a couple minutes to spare. Next stop: Zürich!